If you’re in the habit of spending time around insurance brokers, you probably found them a bit cheerier in 2012. “Things are picking up!” was a common refrain I heard throughout the year. Many report higher volumes and firmer prices. Some are even going so far as to call a turn in the liability underwriting cycle. When I first heard talk of a turn early in 2012, I was skeptical and put myself on the record as such. The main reason for my skepticism was that I could not find compelling evidence of significant underreserving at the industry level. If there is underreserving, of course, it is only a matter of time before the collective confessional and the ensuing chaos that accompanies a turn in the market. But I couldn’t see it—at least not in the most recent accident years. One problem with the evidence on reserving, however, is that it becomes available only with a significant lag (6 months give or take—depending on your data source). So I had to admit the possibility that the brokers were chirping about something that I couldn’t see yet. After all, brokers are the “movers and shakers” of the industry with their fingers on the current pulse of the market. I am just an observer, reading yesterday’s news as reported in the statutory filings whenever the NAIC gets around to delivering it. So I promised to revisit the issue as more data came in. Here’s what I found. I look at two things as “quick and dirty” assessments of industry reserving: 1) incurred loss development on recent accident years and 2) paid-to-incurred ratios. The first indicator gives a sense of recent trends in the industry’s forecasting. Early assessments of accident year losses—especially the first assessment, done at the close of the year—are prone to error since liability claims can take a long time to settle. If the industry’s second and third assessments on the most recent accident years are rising, this means that the industry was underreserving initially and is starting to recognize the error. The second indicator—the paid-to-incurred ratio—gives us a sense of whether the industry’s collective assessment of the ultimate value of incurred losses associated with a given accident year is in line with historical payment patterns. It tells us what fraction of the industry’s projection has already been paid out, so if the fraction is high there is cause for suspicion—it could mean that the industry is underestimating the ultimate value of incurred losses (i.e., the denominator in the ratio) and thus has a reserving problem. Two signals together—a) high paid-to-incurred ratios for recent accident years and b) rising incurred loss estimates—are sufficient for me to become alarmed. Let’s first take a look at the first indicator—incurred loss ratio development. 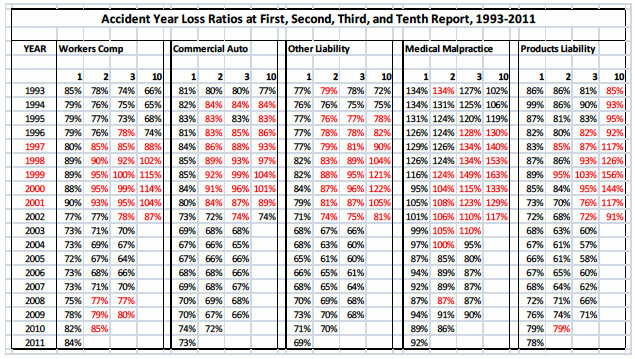 In the table below, I’ve put down the industry’s estimate of the ultimate loss ratios at first report, second report, third report, and tenth report for the 1993 through 2011 accident years for five lines of insurance. I’ve highlighted in red any circumstance where the estimate of the ultimate loss ratio went up relative to a previous report. For example, the industry reported an estimate of 80% for Workers Compensation in its first report of the 1997, but moved this up to 85% in its second report one year later: The second report is therefore highlighted in red. The 10th reports are highlighted if they were higher than the third report. In the sea of red associated with the 1997-2001 accident years, you can clearly see the underreserving leading up to the hard market of 2001-2004. Moreover, even if you would not have known how bad things would ultimately get, these signals were available fairly early. Had you been looking at year-end 2000 data, for example, you would have seen the second report from 1999, the third report from 1998, and the fourth from 1997—and you would seen clear evidence of deterioration across the board, from 1996 through 1999—in every line of insurance listed in the table. What about now, using year-end 2011 data? There is little evidence of aggregate underreserving in recent accident years, with the exception of the Workers Compensation line—where estimates have been deteriorating for the 2008-2010 accident years. What about our second indicator—the paid-to-incurred ratio? 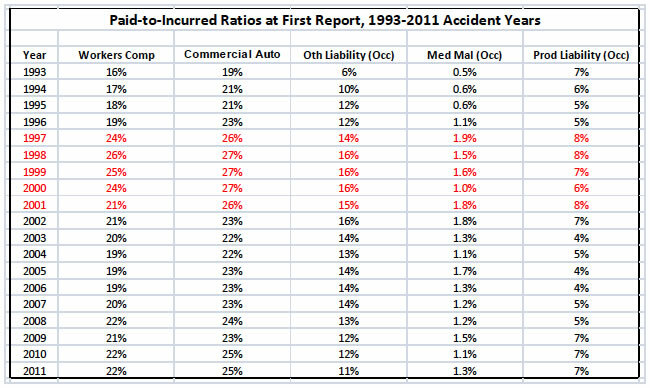 I’ve listed the paid-to-incurred ratio at first report for the five lines of insurance for the 1993-2011 accident years, highlighting in red the most problematic years of underreserving (1997-2001) that flowed into the previous hard market in the table below. Here, the picture is somewhat mixed. Ratios seem to be trending upward in most lines except Other Liability, though we are well somewhat short of the levels seen in the 1997-2001 period. In summary, there are some mixed messages. Workers Compensation in particular appears to have reserve deficiencies in the most recent accident years, and Commercial Auto paid-to-incurred ratios are inching up toward levels not seen since the late 1990’s. On the other hand, the evidence considered here gives little indication of problems in Other Liability and Medical Malpractice. Overall, the warning signals are weak in comparison with those that were flashing, say, in 1999 or 2000. If the market is in fact on the verge of turning, I suspect we are in the early stages of the approach. That said, I’ll keep my eyes open and take a look at the 2012 data when it becomes available to me, which should be shortly.